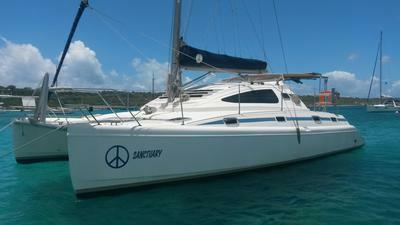 'Sanctuary', is a 2000 Fortuna Island Spirit 37. Built in Cape Town, South Africa. 'Sanctuary' was a popular charter boat that I purchased in June 2010 from Conch Charters in Tortola, where she was used occasionally by the owner (not on charters) from 2008-2010 and was bare boated 2004-08. I lived aboard until April 2012 when she became a bareboat for a year and then I moved aboard again in May, 2013 and brought her to Dominica for day/term charters from Anguilla to Dominica. After a haul and bottom paint in April 2015, 'Sanctuary' was moored in Bequia from May, 2015 to February 2016, and was hauled and painted again, with 4 new motor mounts in August 2016 then moored full time until March 2017 when sailed and upgraded until May 2017. Currently moored in St Maarten for summer, 2017. 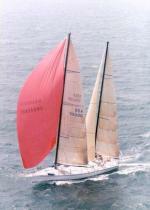 Documented yacht with the USCG, #1105965, registered to Ocean Breeze Tours Inc., Florida. Hull #0034. Insured with year round full coverage including named storms for all of the Caribbean and with a $200/month mooring available. PortVisor cantilever porthole covering, one for each stateroom (4) Lets you leave ports open even during rain or when in storage to prevent mildew. 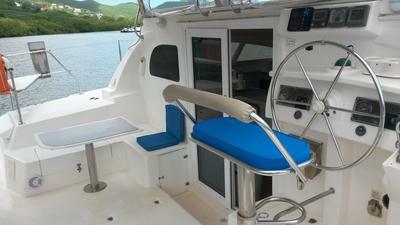 Cockpit lights (2, one new 2016), table, 7 seat cushions. Various pots, pans, utensils, knives, coffee/plastic cups, plates, bowls, etc. Yanmar 2GM20F diesel motors 18hp, (2) total hours unknown, 1700 since June 2010. Engine hour meters (2); not operable, (a third meter inside panel board is operational, at 1536 hours, May 2016), Estimate 1700 hours since June 2010. Fuel tanks completely cleaned and fuel sanitized, 2011, 2015 Biobor used since. 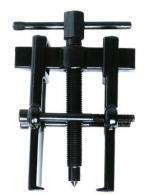 Burns or leaks engine oil about ½ quart every 50 hours in each engine. 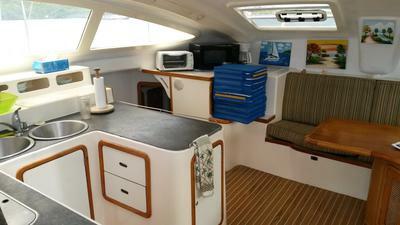 This is a great boat to live aboard, cruise or for occasional use with charter. Now with recent trampolines, sail cover, bimini, LED underwater lights, port rudder bearing, house batteries, motor mounts and more. 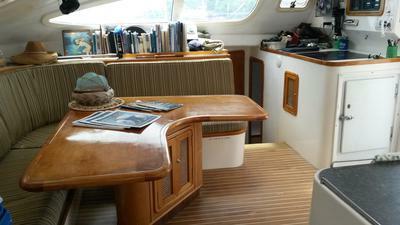 Priced to sell, ready to sail!